Do you have a multi-use athletic field? If you are planning on combining your soccer and football programs on one field, we have the perfect solution. You should consider the "Revolutionary Goal Post" which can rotate a full 180 degrees. One person can turn the goal in less than a minute. It will lock in the forward or reverse position. It is fully secure and tamper proof, and uses two padlocks per goal. The day after the football game you can turn the goal away from the field and have your soccer match without the interference of the goal. We have a wide variety of H-Style football goal posts, standard goal posts, steel and aluminum, and even the combination Football Goal Post/Soccer Goal in a wide variety of sizes and options. Don't let your budget stop you from getting the goals your programs need. Call us today and we can walk you through some great options. Every program should have their school name prominently displayed throughout their facilities. 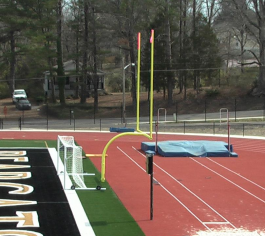 We can customize football goal post pads for your program. There are 14 colors available and you can add the special flare to the field that has been missing. Don't forget the small but important end-zone pylons. These bottom-weighted markers require no additional hardware to install, and will move when an athlete comes in contact. They come in sets of four and help the officials make the crucial close calls. We also carry spring loaded pylons. They work best for natural grass and will stand true for all to see. All our pylons meet NCAA and NFHS rules. Call us today with your football accessories needs.